A portable washing machine is best for people who live in small areas. Not only are they good in performance but also light on your budget. People make use of portable washing machine even if they own a large unit to wash small clothes. Another such advantage of buying a portable washing machine is, they need very less space and save time. (1) You can easily store them in very less space. In addition to that, they are extremely light in weight which makes it possible to shift it from one place to another. 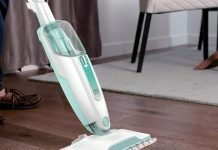 And to end your quest of getting a perfect unit, we present you the best portable washing machine reviews of 2019. Do not let the small size of portable washing machine fool you with its effectiveness. It will clean your laundry similar to that of a big machine. So do not worry as your dirty clothes will come out with the sparkling shine from the mini machine. However, not every product is worth your money. 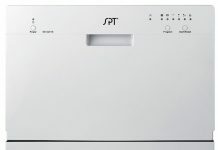 You can also check out our review of the best top loading washing machine. It is best to invest some time in finding the right unit. And our best portable washing machine reviews will definitely help you with that. Now without wasting much time, let us begin with reviews. Large clothes capacity makes giantex portable mini compact twin tub 17.6 lbs washing machine stand first on our review list. Here twin tub indicates 2 separate drums, one for washing laundry and second tub is for spin drying them. While weight capacity of washer is 11 lbs, spinner holds maximum of 6.6 lbs of laundry. Therefore, washer can fit a pair of jeans, 5 t-shirts and 2 shirts in one go. 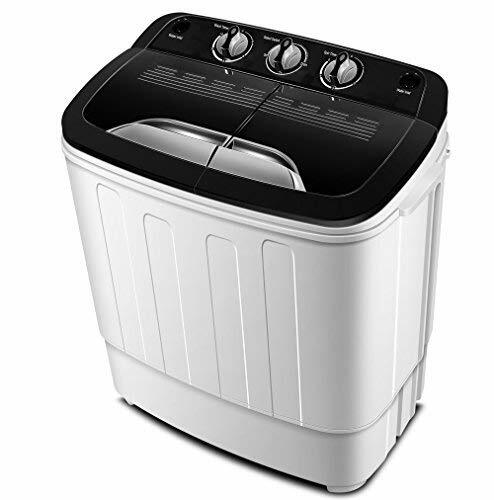 This huge capacity of washer makes it perfect for 2-3 people sharing a dorm or living in RV. Also there are separate timer control settings for wash and spin operations. The giantex portable washing machine features a drainage tube from which dirty water passes out. Further, it comprises of a filter net on the side of washing barrel. This filter collects dirt from the laundry to give you best cleaning. And in order to keep prevent clothes from coming out while spinning, it includes a cover plate. 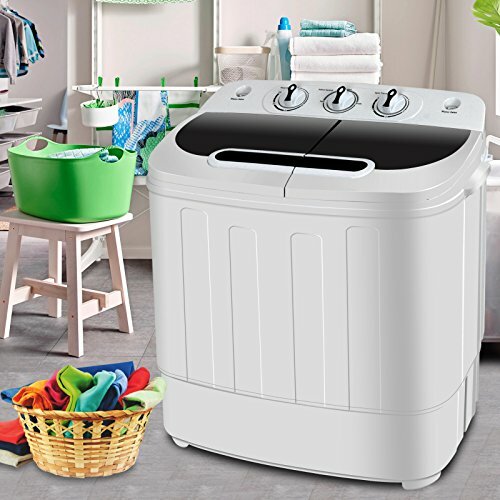 Overall, simple controls, less price and large capacity makes it a best portable washing machine for rv, dorms and apartments. The problem with manual units is, you need to stand next to it to monitor water level. But this is not the case with panda portable washing machine PAN56MGW2 as it is fully automatic. Thus, it will automatically draw water according to the program you select. Speaking of which, panda offers 10 different washing programs and 8 water level settings. 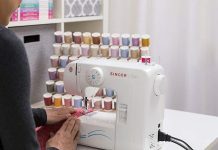 These 10 programs include normal, standard, quick, heavy, soak, air dry, etc options. You can select most appropriate program by simple touch of button. Stainless steel drum of panda portable automatic washing machine can hold up 11 lbs of laundry. This drum is resistant to rust and chipping. 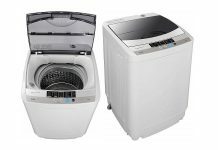 Moreover, size of the unit is very small as both functions of washer and dryer takes place in single drum. And this reason makes it best portable washing machine for apartments and rv’s. Besides that, it is very easy to install unit by yourself. Simply connect the washer directly to your faucet by quick connector adapter kit and hoses. And there you are, ready to wash laundry. Here comes another twin tub washer with good load capacity. Lightweight of this machine makes it perfect for camping and rv. 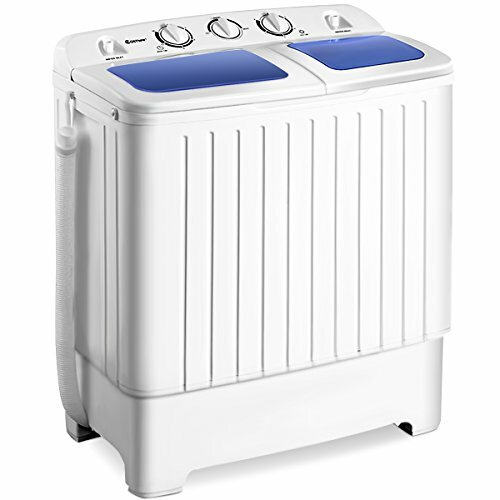 Just like every semi-automatic washer, this small portable washing machine have 2 separate tubs. One is for washing and another tub is for spinning. Load capacity of wash tub is 7.9 lbs whereas spinner can fit up to 4.4 lbs of laundry. This much capacity is good enough to wash 4 t-shirts, a pair of jeans and a light sweatshirt. Further, wash cycle runs up to 15 minutes on either a soft or normal wash. If you’re worrying about installation of the unit then let us tell you that it is extremely easy. You do not need to call any professional for installing this portable washing machine. Therefore, everything you need comes in the box including manual. Apart from that, its high-efficiency motor makes very less sound than similar machines. But above all, less price of the product is what makes it best cheap portable washing machine for camping. We know it is not that easy to deal with small spaces. 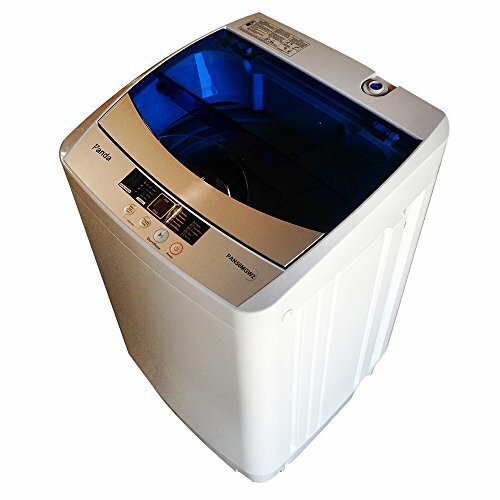 So we have this giantex compact portable washing machine specially for less storage space. First of all it is fully automatic device which means you do not have to stand near it to monitor water level. This in turn saves time you could probably utilize to do other activities. 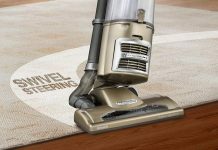 Secondly, it offers 5 programs for different cleaning purpose and 3 water levels. And for easy control, you can adjust different modes and water level depending upon laundry. Honeycomb shape stainless steel drum can load 8 lbs of laundry at one time. And no need to worry about drying clothes separately as one tub does both cleaning and drying. By drying we do not mean that it will completely dry out clothes. It will however, spin your clothes at great speed so that all excessive water goes out through drainage hose. In case you do not how many clothes should you place in a portable washing machine then not to worry. It includes a manual which states approximate weight of various clothes. If you’re looking for a model that can handle delicate clothing then this unit might be perfect for you. The della portable washing machine is deal for doing small loads of delicate clothes like undergarments, socks, t shirts, etc. Its 11 lbs of load capacity can handle various pairs of t shirts at one go. Furthermore, it offers maximum wash timer of 15 minutes but you can reduce it accordingly to laundry. Whereas spin timer goes up to 5 minutes per load. One interesting thing about this portable washing machine and dryer combo is, it allows dual function. This feature allows spin wash and spin dry at same time. So no need to wait for a function to get over just to start another one. However, as it not fully-automatic you need to watch water level. But not to worry as clear lid allows you monitor cleaning, spinning and water level. Conclusively, it is a best portable washing machine for camping in terms of features and money. Long power cord and hose length made us include this product in our best portable washing machine reviews. We often see that people need to buy extension as majority of models come with short cord. But you’ll never experience this problem with this product. Thanks to its 70 inches long power cord and 79 inches long hose. 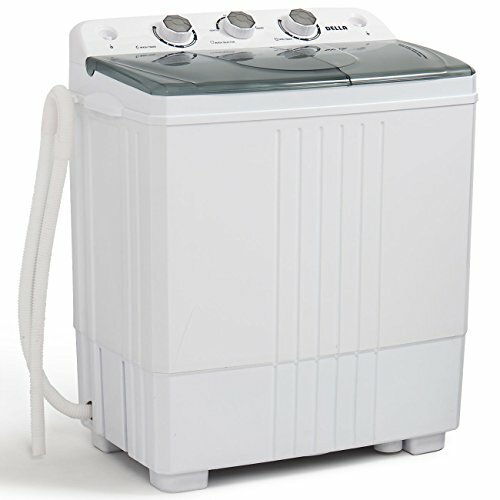 Not only does this portable automatic washing machine provides good cord and hose length but it is great in cleaning too. Therefore, you can worry free throw dirty jeans to delicate wool. 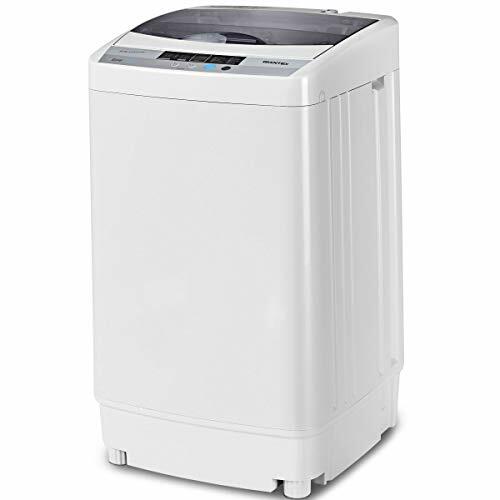 Another strong reason of including this compact portable washing machine is its built-up quality. Its high-density plastic body, aluminium pump and high-grade motor will continue to give best performance for years. Apart from that, you get 2 deep rinse cycles that thoroughly removes all detergent and dirt from laundry. As a result, you get fresh smelling and sparkling clean clothes like never before. Also no need to stand besides it just to monitor water level as it draws water on its own. If budget is not your concern then this giantex portable washing machine is the best you can get. Unlike other models on the list, it offers 8 water level selections. And a led display displays remaining time as well as other functions. These functions include water level, spin, delay and child lock. Under delay function, previous to cleaning, the digital timer shows your preset time but while washing, it shows rest of time remaining. So yes with this mini portable washing machine it is possible to set delay time. 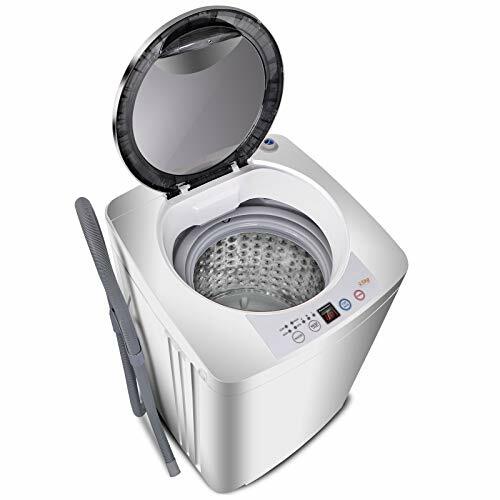 Generally, it is not possible to increase water level in a portable automatic washing machine one you set it. However, this giantex unit allows you to add water. All you need to do is, press water/spin button to add water and un-press to stop. While a clear transparent lid allows you to keep check on water level inside the tub. Apart from that, if laundries inside tub are not put equally, it would cause violent vibration. But no need to worry as unit’s imbalance adjustment function will start automatically to adjust the imbalance situation. So all the features simply contributes in making it the best portable automatic washing machine. Attractive in look, this della large portable washing machine is ideal for family of four. Thanks to its 19.8 lbs capacity that is ideal for doing light to medium laundry loads. And by light loads, it means you can add clothing such as undergarments, socks, t shirts, towels and shirts. All you need to do is, put all your dirty clothes inside the tub, fill in water and set the timer. 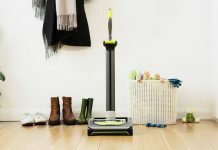 Let the della do its magic and give you tidy clothes. Other than that, it features a built-in drain pump that automatically drains out dirty water. 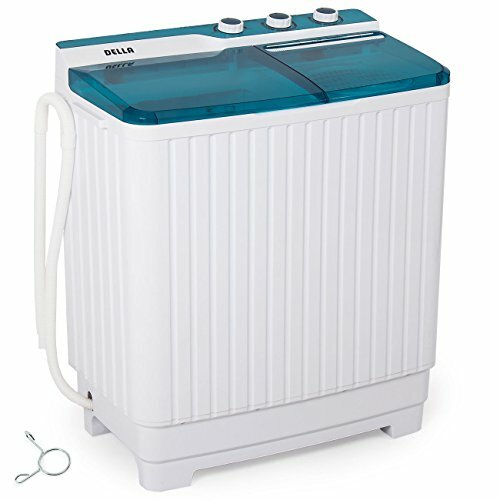 In spite of such large tub capacity, weight of the della portable washing machine is just 46 pounds. This makes it great to use in dorms, apartments, condos, motor homes, RV’s and camping. Also, size of the product is not too big and easily fits in small spaces. It even supports functioning of washer and dryer at the same time. This helps to save a lot of your time. Whereas, the clear lid allows you to monitor all the ongoing process. Thus, large capacity and attractive design of della makes it best portable washing machine for apartments. Hectic life of ours gives us no time for activities like cleaning. And not everyone can afford an automatic unit. So it is good to have a product that allows to do both functions simultaneously. So here comes one of the best rated portable washing machine for people who are always on rush. Thanks to its dual function system that allows you to use washer and dryer at the same time. As a result, you can get your laundry done in half of the time. Moreover, it features 1300 RPM motor with a maximum frequency of 60 Hz. Just like every semi-automatic device, this portable washing machine provides maximum 15 minutes of run time. Whereas, spinner has capacity of 5 lbs. Both the tubs have clear lid on top that allows you to monitor ongoing processes. Besides that, plastic body of the unit makes sure it does not rust out too soon. Also motor operates quietly which causes less vibration. 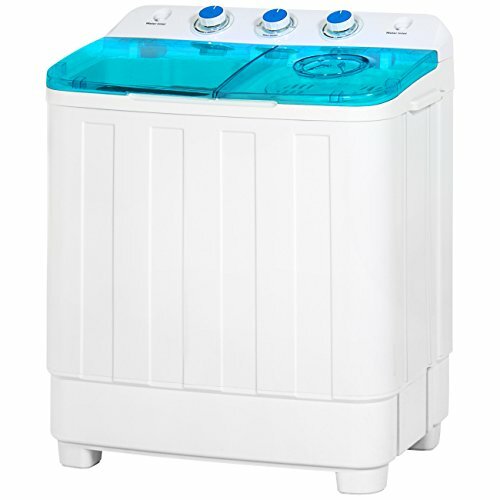 Overall, it is one of the best portable washing machine in terms of money. Yes we know giantex is dominating our best portable washing machine review list. Well, it is because of its quality construction and user-friendly features. And this mini washing machine from giantex is not only great-looking but great on saving energy too. Credit goes to its 70 watts washer and 25 W spinner power. But don’t let less watt of power consumption confuse you with its washing quality. In spite of using less wattage, it can fit up to 8 lbs of garments in one go. And this much capacity is good enough to clean various pairs of clothes. There are 3 control switches on the panel part. Two of which are for setting time and other one is for selecting between normal and strong mode. Apart from that, giantex mini portable washing machine includes a hook on back for power cord. You can wrap and store it conveniently when the unit is not in use. In addition, water inlet insert and pull are very simple, whereas, pulsator ensure safety of whole unit. But above all, less price makes it one of the best cheap portable washing machine under 100. Last but not the least, we have an amazing unit by best choice products. 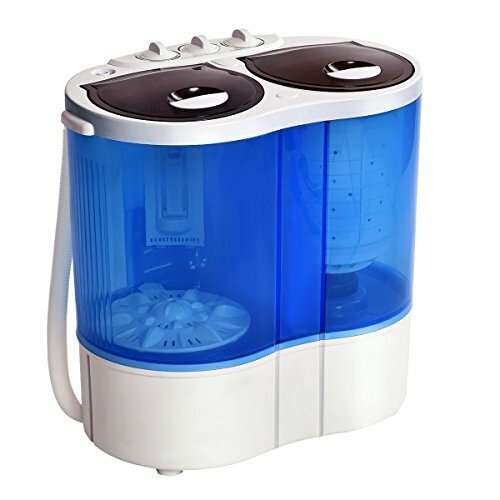 This mini portable washing machine is suitable for people sharing apartment or living in dorms. Thanks to its large tub capacity that can hold up to 12 pounds of load at once. Whereas, spinner can spin dry 6 to 8 pounds of clothes in one go. Not just that, this compact unit can accommodate all types of clothing, towels and more. Also, you can use both the function at same time if you’re in rush. This quick yet efficient cleaning makes it fall under the category of best mini portable washing machine. It provides 2 water inlet hose so that you do have to buy a hose extension. You can use either side of inlet whichever is close to your kitchen faucet. In case you’re still searching for a good kitchen faucet, let us help you with our best kitchen faucet reviews. Moreover, you’ll find 3 hooks on back of unit for proper storage of power cord. To avoid any damage due to electric fluctuations, you must turn off switch or remove plug after every use. 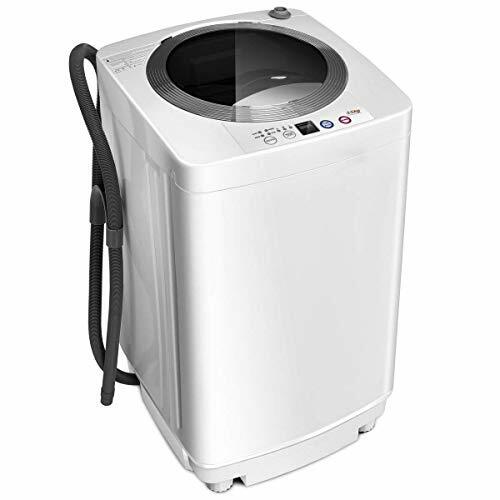 So conclusively, all the features simply contributes in making it one of the best portable washing machine. Homestuffpro understand that portability is primary need if you live on rent or small spaces such as apartments, dorms or RV. And no matter where we live, we want the clothes we wear to be tidy and clean. Hand washing them is one way to go but it might stress your body out. So there are these portable washing machine to help you with your laundry. There are lot of benefits of buying a portable washing machine. First of all, it comes in budget especially the semi-automatic ones. Secondly, running cost of a portable machine is lot less than what you pay at laundromat. Also they save time of going to and coming back from a laundromat. Further, they are light in weight which allows you to easily shift them. You can even take them to camping or other such outgoing without much hassle. And finally, wash quality of a portable washing machine is similar to that of a big unit. In fact it gives almost same results in short period of time. Now you have got good results to say goodbye to washing clothes by hands.